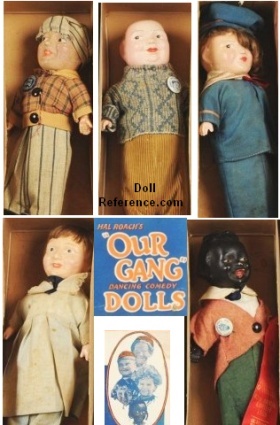 1926 Our Gang Dancing Comedy Dolls 12"
Sayco sold dolls through mail order as premiums to wholesalers and jobbers. Sayco made dolls of wood, cloth, latex, hard plastic & vinyl. About 1950 Irene Szor was employed at Sayco as a clothing and doll designer, after seven years Szor left to work for the Paris Doll Corp. Above photo description; 1926-1930 Our Gang Dancing Comedy dolls (set of five) who are 12" tall; Freckles (Richard Mickey Daniels, Jr.), Fatty (Joe Cobb), Jackie (Jack Davis), Mary (Mary Kornman) with a short wig, Farina (black child star Allen Hoskins), comedy characters from the Our Gang movie by Hal Roach, they are wind up dolls with composition heads & hands, with metal legs & feet, that twirled and danced when wound up & released, dolls are unmarked. 1925 Sayco Dancing Katharina doll, 12" tall, Katharina is constructed similar to the above Our Gang wind up dolls, composition head and short arms, cloth covered torso with wind up mechanism / key in back, metal legs and feet /shoes, blonde braided mohair wig, blue painted eyes, closed mouth, she is wearing a felt hat, long sleeve blouse, pants and metal painted shoes, doll is unmarked, came with a paper hang tag as shown on right; Sayco Registered Trade Mark Dancing Katharina Pat. Applied For. ca. 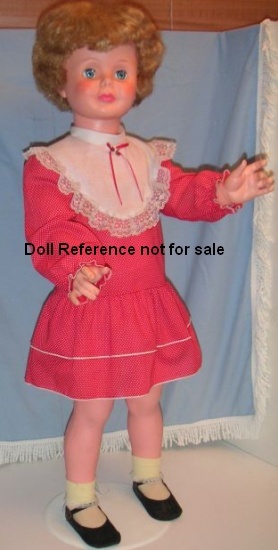 1950s Sayco Cinderella doll, 29" tall, Playpal type, hard plastic, sleep eyes, wigged, wearing what we have dubbed a "Cinderella style dress, Princess or Flower girl" in pink taffeta, short puffed sleeves, peplum short over skirt, doll marked Sayco. ca. 1950s Cinderella doll, 29"
ca. 1950s Sayco Girl doll, 14" tall, marked: Made in USA, hard plastic, sleep eyes, blonde wig, original outfit in blue and white dress, trimmed with white ric rack and red ribbon bow at waist and found in her Sayco marked box. ca. 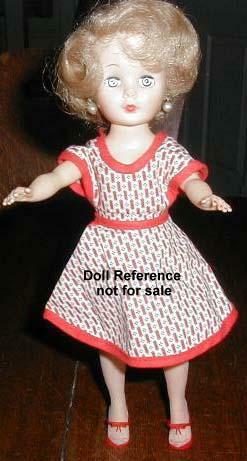 1950s Blonde Girl doll, 14"
ca. 1955 Sayco Bride doll, 20" tall, vinyl head with rooted blonde hair, green sleep eyes, one piece squishy body, marked Sayco on neck and dressed in her original Bride gown. 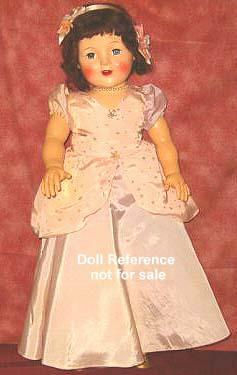 Photo courtesy of Jane Thorman, and is Jane's Aunt's Bride doll. ca. 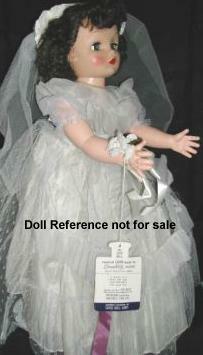 1955 Bride doll, 20"
ca. 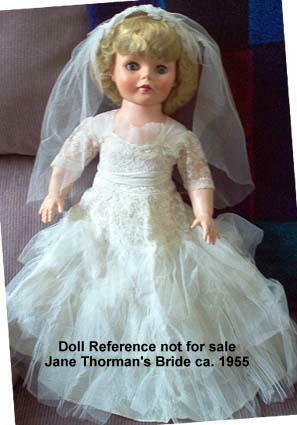 1950s Sayco Bride doll, 20" tall, vinyl doll with rooted hair and sleep eyes, dressed as a beautiful bride in gown and veil. ca. 1950s Bride doll, 20"
1955-1957 Sayco Dream Girl doll, costumes for 8" tall hard plastic dolls, clothes are untagged but box is marked Sayco, snaps have "Dot Snapper" on them. One would assume they offered a doll that fit these as well. The Sayco Dream Girl doll shown is 14", mint in her box, so there must have been various sizes sold under this doll name, other than the clothing noted above. 1955-1957 Dream Girl doll, 14"
1957-1959 Sayco Miss America Pageant Doll, 11" tall, hard plastic chubby body with vinyl head, rooted hair, sleep eyes with molded upper lashes and lower lashes painted, jointed at shoulders, hips and knees, dressed in her formal Miss America gown, red cape, tiara and scepter, also came wearing a Wave uniform with "USA" printed on her purse, 50 outfits could be purchased separately, head marked: s, Sayco or unmarked. 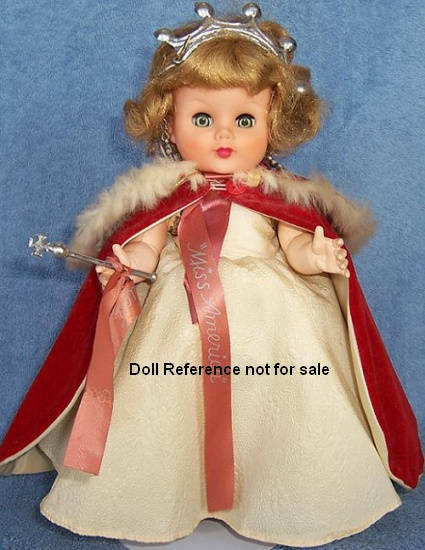 1957-1959 Miss America Pageant doll, 11"
ca. 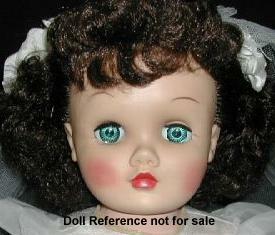 1960s Sayco Playpal type doll, 36" tall, hard plastic jointed body, vinyl head with short rooted hair, sleep eyes, closed mouth, doll marked on back of neck: Sayco. ca. 1960s Playpal type doll, 36"
1960s Sayco High Heel Fashion doll, 10 1/2" tall, hard plastic body, vinyl head with rooted hair and sleep eyes, Little Miss Revlon like, doll marked Sayco. Other size Fashion dolls have also been found. 1960s Fashion doll, 10 1/2"
1960s Sayco Miss America doll, 19" tall, hard vinyl body, soft vinyl rooted head, jointed shoulders, waist and legs, high heel feet, wore a white satin gown with red fur trimmed cape, white heeled shoes, plastic silver tiara , jewelry and a royal scepter, head marked: 14R. Came with an entry blank for the Little Miss America Annual contest, closes July 27th, entries received after this date will be automatically entered into the next Miss America's contest, (however no year is listed, so we guess there's still time to enter . . . lol). 1960s Miss America doll, 19"
1960s Sayco Baby Coquette doll, size unknown, Ideal Thumbelina like baby doll or Vogue Baby Dear doll, stuffed cloth body with vinyl head and limbs, rooted hair, sleep eyes. Unsure how she was originally dressed. 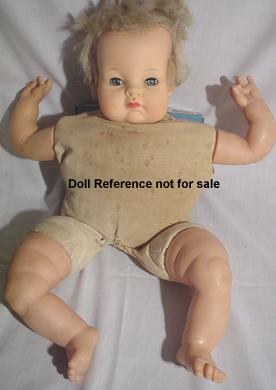 Doll marked on back of neck; PAT. 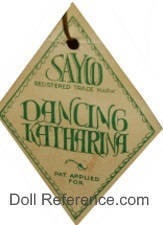 1922 Sayco Walking and Talking dolls were advertised. 1924 Sayco registered trademarks; My Bunny Boy doll, Teddy in Boots, Mistah Sunshine, Jiggles the Clown, a topsy-turvy doll named Hell'n Maria or Miss Helen Maria. 1939 Sayco Princess Beatrix doll head mold (doll is not named), 19- 20" tall, composition flange head, full arms and bent legs to above the knees, cloth body and upper legs, stitched hips, painted molded curly dark brown hair, sleep flirty eyes that move side to side, closed mouth, no clenched fists. This head mold was also used by other doll makers including Ideal and an unidentified company whose doll is unmarked. 1960s Sayco Mommy's Baby doll, a baby type doll and 1960s New Happy Time Baby doll, also a baby type doll. 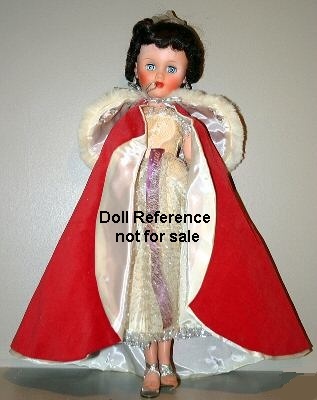 1962 Sayco Boudoir doll, 26" tall, plastic limbs, stuffed cloth body, painted features, slightly closed eyes, wide closed mouth, vinyl head with rooted hair, wore a satin and tulle gown with high heels, marked: © Sayco Doll Corp., sold through Sears.